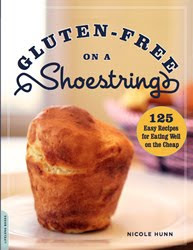 You don’t need me to tell you about Gluten-Free on a Shoestring (Da Capo Lifelong). If you are celiac or otherwise gluten challenged or limited, the cover alone will sell you on this book. It’s a popover. A s imple popover. Nothing in it. No big deal, right? But for the many people who can’t or shouldn’t eat wheat, it’s a promise. One that, ultimately, author Nicole Hunn fulfills. The other part of the promise is in the title itself: that shoestring stuff. As anyone who has cooked for a celiac knows, gluten-free baking can be super expensive. Up to 250 percent more than conventional foods according to the book. “If you’re newly gluten-free,” Hunn warns, “you’re probably still suffering from sticker shock. One day you’re spending a modest $2.50 for a loaf of bread at the supermarket, and the next, you’re paying $8.00 or more for the gluten-free version.” It’s enough to drive you to do your own baking! Especially when the results can be this good. In Gluten-Free on a Shoestring Hunn attacks every meal of the day with superb results. Banana-Blueberry Muffins. Potato Gnocchi. Spinach Pie. Chicken Pot Pie. Cookies, cupcakes, scones, cakes, breads. Hunn’s approach is delicious, inexpensive and easy: no mystery at all. Aaron Blanton is a contributing editor to January Magazine. He’s currently working on a book based on his experiences as an American living abroad.